Alberti's Window: Condivi and Michelangelo's "Pietà"
Now, in the great scheme of things, perhaps it isn't too a big deal that my textbook misattributed this self-portrait information to Condivi instead of Vasari. I understand that. But I also am in favor of historical accuracy, and I thought I would put the record straight here. If any of my past students are reading this, please make a note of the error on page 69 of your textbook! That being said, this misattribution happily led me to become familiar with Condivi's book first-hand. Many scholars believe that Condivi's work is the best account of Michelangelo's life; this book can practically be considered an autobiography. Condivi wrote that he got his information "with long patience from the living oracle of his [master's] speech. "3 It appears that Michelangelo wanted this biography to be written for two reasons: 1) to correct omissions and errors about Michelangelo that appeared in Vasari's first edition of Lives of the Artists and 2) to exonerate Michelangelo from accusations that he deceived the heirs of Julius II and embezzled sums of money (in regards to Michelangelo's seemingly-endless sculptural project for Pope Julius II's tomb). However, this Pietà never was placed next to Michelangelo's tomb. Vasari, who designed Michelangelo's tomb, unsuccessfully tried to acquire the Pietà from the family who owned the sculpture at the time. 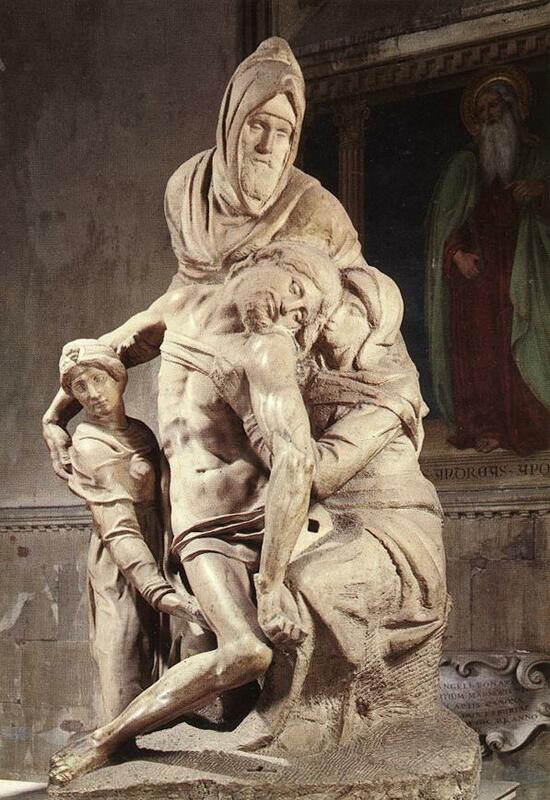 However, I think it's best that Vasari didn't get his hands on the Pietà: it appears that Michelangelo changed his mind and didn't want the sculpture for his tomb after all. In 1555, two years after Condivi wrote his biography, Michelangelo abandoned and mutilated the Pietà. He then sold the sculpture in 1561 to his friend Francesco Bandini, a Florentine banker in Rome. So if Michelangelo sold the sculpture, it's very likely that he had no intention of using the sculpture on his own tomb. In a way, I'm surprised that Vasari didn't pick up on that simple concept. A lot of scholars have discussed and analyzed why Michelangelo mutilated the Duomo Pietà, and I think I will compile some thoughts in a forthcoming post. Stay tuned! 1 Catherine King, "Italian Artists in Search of Virtue, Fame, and Honor c. 1450-1650," in The Changing Status of the Artist by Emma Barker, Nick Webb and Kim Woods, eds. (London: Yale University Press, 1999), 69. 2 Ascanio Condivi, The Life of Michelangelo, translated by Alice Sedgwick Wohl, edited by Hellmut Wohl, 2nd ed. (University Park, PA: The Pennsylvania State University Press, 1999), 140 (my emphasis). I realize that the Changing Status textbook could be referring to something else written by Condivi besides his biography (such as a letter), but I highly doubt it. The editor of this Condivi text probably would have mentioned if Condivi had written anything about Michelangelo's self-portrait, instead of only mentioning this letter by Vasari. 4 Ibid., 90. Michelangelo wanted to be buried in Santa Maria Maggiore, but was actually interred in the Florentine church Santa Croce. Vasari writes details of the internment (and opening Michelangelo's casket to reveal a body untouched by decay!) in his second version of Lives of the Artists (1568). See Giorgio Vasari, The Lives of the Artists, translation by Julia Conway Bondanella and Peter Bondanella (London: Oxford University Press, 1991), 486.